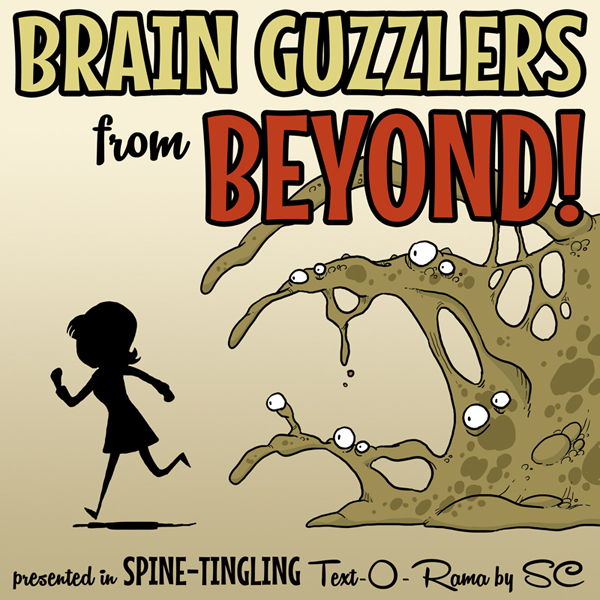 Brain Guzzlers from Beyond! is a parser puzzle game set in the trope-world of 1950s alien invasion movies. The author is Steph Cherrywell, author of Jacqueline, Jungle Queen! and Chlorophyll, both thoroughly enjoyable easy puzzle games. It promises to be polished, with this nice cover art and an attractive feelie as well. There were teasers for it on the IF forum months ago, and the blurb is charming and confidently written. This is basically as good a first impression as a comp game can make. I played to what I believe is the only winning ending. It took me most of the two hours of comp judging time, and I had to get a hint from another player for one bit, but I didn’t need to take any notes. Some players may find they want to map. And indeed, Brain Guzzlers from Beyond! matches up with a lot of what you might expect from Cherrywell’s previous work: an entertaining, lightly parodic narrative voice that nonetheless remains affectionate towards the thing it parodies; a brave heroine; reasonably accessible puzzles; heavy use of the tropes of the genre it’s taking off. To the north is Make-Out Mountain, and flanking it are a number of less controversial mountains. At the same time, this piece is distinctly more ambitious than either Chlorophyll or Jacqueline, Jungle Queen! : the plot is longer and more complicated, and there are more NPCs offering a greater amount of interaction. Most of Chlorophyll takes place in a conveniently abandoned station, but Brain Guzzlers is happening in a town full of other characters, from the police chief to the town beauty queen. The story takes place over several days, and the town undergoes various changes in that time, a little in the style of Wishbringer. And there are some nice extra touches, such as a puzzle that has an alternate solution if you happen to have made a particular personality choice right at the beginning of the game. A lot of effort has also gone into the look: at least if you play it in an offline interpreter, there are character drawings for all the characters as well as the cover art (and in some cases, multiple character drawings for when the characters are in different states). Structurally, Brain Guzzlers pulls one other clever trick: it uses menus for conversation, and then it places its big action sequences inside those conversations. Which means that during the portions of the game where the pacing matters most, when you’re, say, running away from something, you’re not fumbling with finicky commands. But during the other, calmer parts of the game, you still have the pleasure of freeform exploration that the parser affords. I also really liked the team of characters in this game. In addition to the heroine, there are several key sidekick NPCs who wind up being significant to solving the puzzles in the latter half. The development here is played for comedy — the game is overtly poking fun at 50s gender roles, starting with the personality quiz at the very beginning. But underneath that surface, Brain Guzzlers is quietly inclusive, and it shows several of the main characters discovering their own strength. It pushes back on the idea that someone with a feminine presentation is therefore not technically capable, or that traditionally female pursuits such as cooking don’t require genuine expertise. I’m almost reluctant to bring this up, actually, because I felt that one of the things about Brain Guzzlers was that it implies this worldview without being preachy about it. Suffice it to say that this is a fun game with lots of enjoyable things happening, which also features the world-saving competence of several women and POC. It’s not utterly flawless — there are a few places where I felt like it missed a trick recognizing a command. (Don’t try to DRIVE the car in the first scene, for instance — or rather, you can, but the attempt won’t do anything. You’ll need to interact with the parts of the car instead.) You need to TALK TO NPCs, and ask/tell commands don’t necessarily redirect that properly. And once I managed to see an object that I wasn’t suppsoed to see until much later by doing a TAKE ALL and finding (accidentally) that it was an unconcealed item in an NPC’s possession. But honestly, these are niggles with a game of this size, scope, and general quality. I had a lot of fun with this game — for sheer entertainment value it ranks very high, and it was one of my favorites in the competition overall. I was unreasonably amused by the puzzle where you have to feed Warhol’s sketchbook to a junkyard goat. Amused that I thought of it, amused that that was the right answer, amused that that was the fate of such a valuable artifact. It’s not quite participatory comedy as conventionally defined in IF, but one of the great things about parser IF is when the game lures you into entering a command that you really don’t expect to work (but you just have to try anyway), and then it proves successful beyond your dreams. Similarly, there’s one moment that I found genuinely horrific, when the protagonist discovers that the police chief has been killed because of the weird plant/egg object that she brought to him. In one sense this isn’t her fault — she tried to warn him about the dangers and he refused to listen to her — but in another sense, this man’s demise is the direct result of our cooperation in an earlier fetch quest. The game doesn’t really spend a lot of time on that issue, and the goofy humor aspect of it resumes quickly, but the encounter gives the rest of the game a gravity it might otherwise have lacked. This entry was posted in Competitions, parser, Reviews and tagged brain guzzlers from beyond, steph cherrywell by Emily Short. Bookmark the permalink. >A form of comedy created when the actions of the PC are the instigating factor in humorous events that occur as part of the game world. Maybe I’m missing some nuance here, but the sketchbook gag seems to fit the bill well enough? The author gives you the props, so to speak, but it is your hand that puts them together in a humorous manner. In the original example quoted, the player enters commands that are not in themselves funny, and without expecting any humor from the scenario. But funny things result, because the player has forgotten something important about the world state. In the goat-sketchbook scenario, the goat eating Warhol’s sketchbook because it contains a picture of a can is the punchline, so the player is intentionally telling the joke themselves. Hm. So player intention is the key difference? Sort of — specifically, whether the player is actually thinking of and intending the punchline themselves, or whether the player is just led into providing the setup. For what it’s worth, I had forgotten about the cans when I tried giving the sketchbook to the goat– mostly because there just wasn’t much else to give to the goat. So the punchline was a surprise to me (and enjoyable). The RPS Cannon would probably also have qualified if I hadn’t already figured out what it was (and also if I hadn’t gone to the walkthrough due to time constraints before figuring out where to use it).